Determining of the composition and the concentration of a substance is an essential part of many industrial processes and widely used in chemistry, biology, geology, space exploration, agriculture, medicine, criminalistics, and other fields. 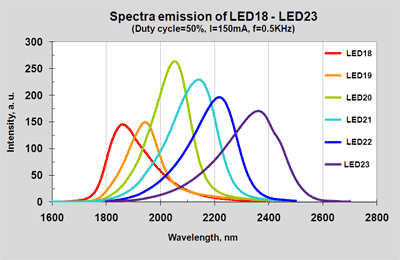 IBSG company in collaboration with the Infrared Optoelectronics Laboratory of Ioffe Physical–Technical Institute has developed a series of high-performance LEDs completely covered the spectral range of 1.6 - 5.0 µm. 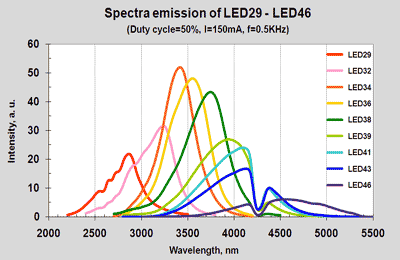 This mid-infrared spectral range contains the absorption bands of water vapor, carbon dioxide, nitrogen-containing molecules (N2O, NO2, NH3), hydrocarbon molecules (methane) and many other organic and inorganic substances. 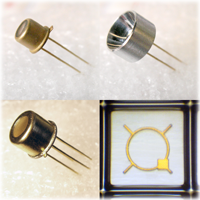 Mid-Infrared LEDs are perspective sources for developing the portable gas sensors for measurement of concentration of different gases. Another important area of gas sensor application is medicine. Sensitive diagnostics of various diseases can be provided through analyzing a chemical composition of expired air, blood and skin. Despite of progress in the development of chemical and adsorption gas sensors, optical sensors have many advantages such as high selectivity, stability in aggressive environments, high operating speed.